The forum was hosted by KoSIF, a supporting organization of UNEP FI to celebrate its 10th anniversary, and was attended by representatives of four of the five major candidates’ offices. The presidential election is scheduled for early May, and ESG and the National Pension System issues are attracting a lot of interest. 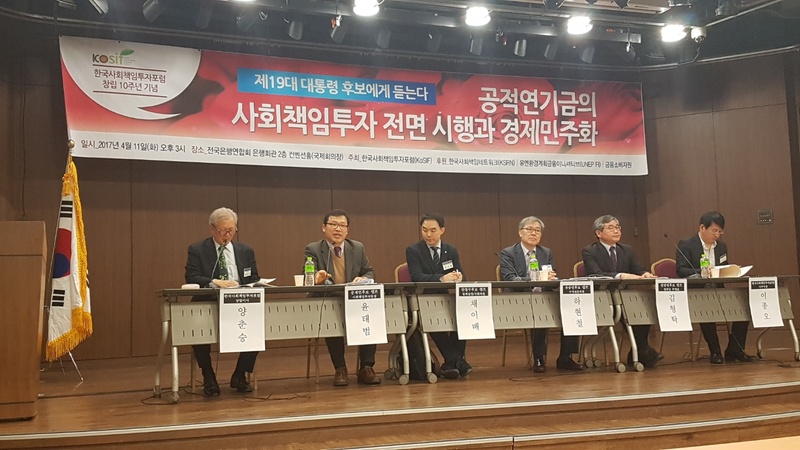 The candidates were asked to share their views on integrating ESG matters into National Finance Act, which governs the National Pension system, as well as mandatory ESG information disclosure. All four candidates agreed that ESG matters should be legally integrated into the National Pension Service, as well as mandatory ESG information disclosures. They differed on the progression speed, with some favouring a slower approach, while other candidates said it should be done immediately. For ESG mandatory disclosure, special emphasis was made on global standards such as ISO 26000. Despite different approaches, all candidates agreed that ESG integration into the corporate and finance structure of South Korea could no longer be slowed. This shows that whomever becomes president, the consensus is clear in which direction South Korea’s National Pension Service will be moving.